The primary objection I hear against the infallibility of the Bible is, “Well, who wrote it?” The argument goes something like this. The Bible was written by men, therefore it contains errors since men are mortal, thus fallible, therefore the Bible cannot be infallible. There are people who consider themselves to be Christians who do not believe the Bible is God’s Word, without error or contradiction. They will produce Scriptures that supposedly contradict each other as proof of their assertion. Non-Christians do this as well, and I suspect for the very same reasons. Belief that the Bible is not really God’s Word allows Christians the ability to pick and choose which Scriptures to obey while it gives non-Christians the ability to disregard all Scriptures and continue in their belief that there is no God. Either way, the Scriptures become irrelevant to both groups. If you are a non-Christian, I won’t be able to convince you that the Bible is God’s Word. Only God can convince you of that fact. To those Christians who don’t believe the Bible is God’s Word, without error or contradiction because it was written by men, please consider the following. Yes, the Bible was literally written by men, but not just any men (more than 40 in fact). These men were under the influence of the Holy Spirit. 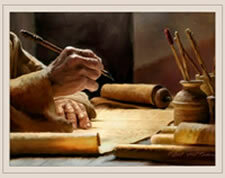 What they wrote was not conceived in their own minds, but was given to them by the Holy Spirit. This is one reason only 66 books were approved and included in the canon of most Christian Bibles including Roman Catholic versions. Although not included in the canon, some Christian Bibles include apocryphal books for reference. After considering all the others, including the Gnostic gospels and the apocrypha, scholars under the influence of the Holy Spirit, chose only those books that met very strict criteria and closed the canon. See The Canon and Reasons the Apocrypha Does Not Belong in the Bible for more information on those topics. Are you still not convinced? Do you believe what you are being taught in Church? Who is your priest, preacher, minister, pastor? Do you believe what comes out of the mouth of popes? What makes their preaching true yet the Bible untrue? Is it possible for anyone to speak for God while he is under the influence of the Holy Spirit? If it is true for your priest or preacher, isn’t it also possible that it might have been true for those who wrote the Bible? Here is a fact. The Bible, although it has changed due to language considerations, has not changed in its content. While translations from the original Hebrew and Greek texts have given us many English versions, these translations have not changed the original content or meaning of the Scriptures. Here is another fact: Preachers of all sorts, whether Catholic or Protestant, interpret the Scriptures to fit their own denominational beliefs. The Scriptures don’t contradict themselves; it is preachers who contradict the Scriptures they contradict themselves and they contradict each other. Is it any wonder there are so many denominations? The Bible contains 66 books that were written over a 1500 year period by over 40 different authors on 3 different continents, Africa, Asia and Europe and has been translated into over 1,200 languages. See About the Bible for more information. How is it possible that more than 40 different authors of 66 books over a period of 1500 years, separated by 3 continents, conspired to tell their portion of a complete story as concisely and with such unity as the Bible? The answer is simple. As Jesus promised, He sent the Holy Spirit (John 14:15-17) and the Holy Spirit taught them and reminded them of everything Jesus told them (John 14:25-26). The authors of the Bible were inspired by the Holy Spirit to write God’s Word to teach future generations until Jesus returns. If the Bible is not God’s Word then priests, preachers, ministers, pastors and other religious teachers who claim to preach from the Bible are frauds and are not to be trusted either. There is a standard by which we can measure truth. That standard is the Bible. Without it, anyone who claims to speak for God can say whatever he wants to win followers. Those who distort the truth only do so for their own gain. They have an agenda, usually for power, greed and influence. These usually turn into cult leaders although not always so conspicuously as Jim Jones or David Koresh. May your standard for truth come from the Bible, written by men, inspired by the Holy Spirit.